Batkovski, Tome; Rajkocevski, Rade (2014). "Psychological Profile and Types of Leaders of Terrorist Structures - Generic Views and Experiences from the Activities of Illegal Groups and Organizations in the Republic of Macedonia". In Milosevic, Marko; Rekawek, Kacper. Perseverance of Terrorism: Focus on Leaders. Amsterdam: IOS Press. pp. 84–102. ISBN 9781614993872. Endresen, Cecile (2016). "Status Report Albania 100 Years: Symbolic Nation-Building Completed". In Kolstø, Pål. Strategies of Symbolic Nation-building in South Eastern Europe. Farnham: Routledge. pp. 201–226. ISBN 9781317049364. Fischer, Bernd Jürgen (2007a). "King Zog, Albania's Interwar Dictator". In Fischer, Bernd Jürgen. Balkan strongmen: dictators and authoritarian rulers of South Eastern Europe. West Lafayette: Purdue University Press. pp. 19–50. ISBN 9781557534552. Goldwyn, Adam J. (2016). "Modernism, Nationalism, Albanianism: Geographic Poetry and Poetic Geography in the Albanian and Kosovar Independence Movements". In Goldwyn, Adam J.; Silverman, Renée M. Mediterranean Modernism: Intercultural Exchange and Aesthetic Development. Springer. pp. 251–282. ISBN 9781137586568. Kronenbitter, Günter (2006). "The militarization of Austrian Foreign Policy on the Eve of World War I". In Bischof, Günter; Pelinka, Anton; Gehler, Michael. Austrian Foreign Policy in Historical Context. New Brunswick: Transaction Publishers. ISBN 9781412817684. Puto, Artan; Maurizio, Isabella (2015). "From Southern Italy to Istanbul: Trajectories of Albanian Nationalism in the Writings of Girolamo de Rada and Shemseddin Sami Frashëri, ca. 1848–1903". In Maurizio, Isabella; Zanou, Konstantina. Mediterranean Diasporas: Politics and Ideas in the Long 19th Century. London: Bloomsbury Publishing. ISBN 9781472576668. Schwartz, Stephan (2014). 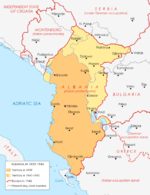 "'Enverists' and 'Titoists' – Communism and Islam in Albania and Kosova, 1941–99: From the Partisan Movement of the Second World War to the Kosova Liberation War". In Fowkes, Ben; Gökay, Bülent. Muslims and Communists in Post-transition States. New York: Routledge. pp. 86–112. ISBN 9781317995395. Stojarova, Vera (2010). "Nationalist parties and the party systems of the Western Balkans". In Stojarova, Vera; Emerson, Peter. Party politics in the Western Balkans. New York: Routledge. pp. 42–58. ISBN 9781135235857.